While the New York City subway system has improved by leaps and bounds since the days of squealing graffiti-covered, crime-riddled trains, stations are still an unpleasant reality. Between the grime, stench, heat and noise of oncoming trains (which in turn makes it impossible to hear indecipherable, possibly important announcements), by the time the actual train shows up we’ve had our share of city cacophony. The good news is that an engineering firm is working with the MTA to create the amazing possibility of quieter subway stations, Wired reports. The challenge of quieting the din lies in the fact that a subway station has to be “incredibly strong, graffiti-proof, soot-resistant, human bodily waste-resistant,” according to Alex Case, an architectural acoustician with the University of Massachusetts Lowell. This indestructible infrastructure by nature creates an echo chamber that amplifies the racket. 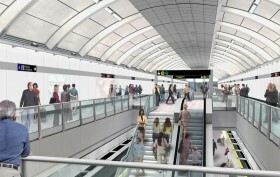 Engineering firm Arup has been hired by the MTA to improve the acoustics of the new Second Avenue line, the first phase of which–a stretch of track that lies 10 stories below the Upper East Side–is scheduled to open this December, with 8.5 miles and 16 new stations on the way when the line is complete.